Lets join together once again at the lovely “Dancing Crane Imports” classroom, where we will dive deeper into the power of Mudra, Mantra, and the ancient technology of the Mala. 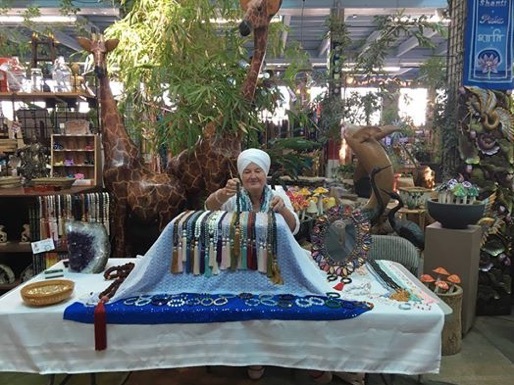 Kudrat Kaur specializes in Naad Yoga, the science of sound, and in the ancient art of healing through gemstones, meditation, mudra and mantra, using the mala as a tool (which she makes personally, using the ancient technology of precious and semi-precious gem stones). She will share an ancient healing hands meditation as taught by Yogi Bhajan *Kudrat Kaur will bring over 50 new meditation malas for your enjoyment, to use in class or purchase after class, for those interested. (cash, checks or credit cards accepted)! Give yourself the gift of healing, the gift of spirit! Snacks and Golden Milk (vegan) will be served.